The Infiniti M35h has set a new Guinness Book Record for being the fast hybrid on the European market. Infiniti has just announced that their new M35h has set a Guinness Book of World Record for being the fastest full hybrid vehicle on the European market. Set to go on sale in 21 European markets shortly, the M35h set a record on August 23rd at the Santa Pod Raceway in the UK, which is home to the FIA European Drag Race Championships. Powered by a 3.5-liter V6, which is complemented by a 67hp electric motor, it went from 0 to 62mph in 5.5 seconds, officially making it the fastest full hybrid on the market. The record time will be printed in the 2013 edition of the famous record book. Using Infiniti&apos;s Direct Response Hybrid Technology, power goes to the rear wheels via a two-clutch system that&apos;s able to maximize performance and efficiency that allows for the car to run in electric-only mode at speeds up to 74.56mph. 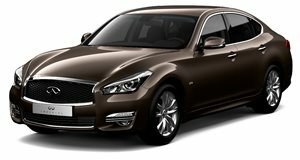 Although the Infiniti M is well known to North Americans, this is the first time the Japanese automaker will be selling it in Europe. Already in its third generation, Infiniti wants it to take on the likes of the BMW 5-Series and the Jaguar XF. It is the only sedan in its class in Europe to be offered in gasoline, diesel, and hybrid forms. Infiniti is claiming they want to boost sales in Europe with a goal to reach 10 percent of the luxury sector by 2016. It won&apos;t be easy considering there are plenty of other luxury automakers currently experiencing record sales, but the fact that a hybrid has respectable performance numbers may just be the ticket needed to make a good first impression.